about. Lunchtime formula: 18.90 € (during the week). Welcome groups. Terrace. Here is a warm address that has just changed owners! 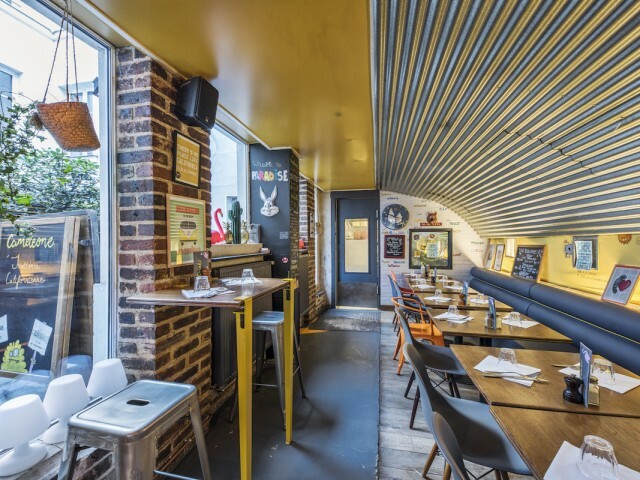 With its corrugated iron interior and walls alternating yellow and gray coloring, it is almost like a Californian shop on the edge of the Pacific ... The challenge of Caméléone is to take customers in latitudes a little sunnier. And the menu, mixing Italian accents with touches of world food, while respecting the quality and the freshness of the products, consists of a selection of electic dishes. We attack with a plate of three or six antipasti - guacamole, parma ham and spinach with peanut butter - to go to a plate of fresh homemade pasta - such as linguini chicken, homemade foie gras Tagliatelle. Or a more distant dish such as tandoori chicken skewers, trio quesadillas or the famous California Burger! The dessert platter flirts with more Anglo-Saxon recipes: cheesecake and raspberry coulis, pecan pie or brownie and peanut butter ice cream. Dynamic and pleasant team for a very busy place on the market square. The most of the restaurant: its beautiful terrace of 70 seats.